Hair today hair tomorrow is what everybody would always love to have. Every day we get phone calls and emails asking about people getting help with their hair problems. 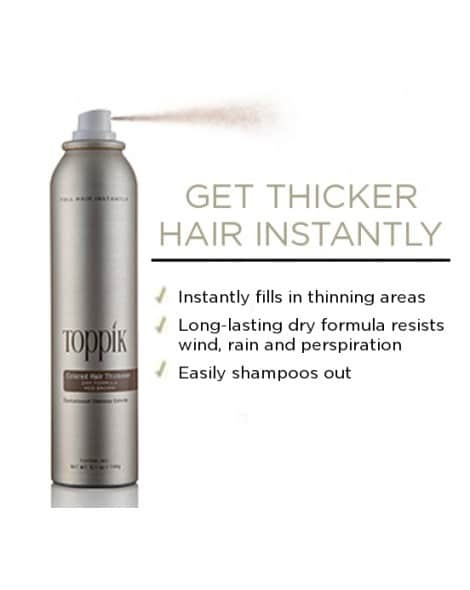 There is no faster fix for your hair problems that the vast range of Toppik hair products. We hear happy customers tell us all the time how pleased they are, this is just one comment sent to us no less that three days prior to this posting “I’m loving the product it’s great I’ll definitely stick with Toppik” and this was a customer who had been going to a professional hair studio and doing everything they told him to do until he realised he did not have to pay the over expensive prices for all the goods in the salon. He discovered Toppik, not only is our client happier he is also saving a lot of money. We got an email one week prior to this posting from a customer saying “Your help and guidance with my order was very much appreciated, thanks a million.” this is the kind of email we love to get. While we know that Toppik may not suit everybody, as humans we are all different we all see and feel things differently so our perception of how a product works for us can vary. We are of course glad to say that we have many repeat customers and we love to see that because only then can we get confirmation that Toppik is working for them. As you know the fibres are great, have you tried the Toppik Coloured Hair Thickener? If not may we suggest you give it a go! We sell a lot of this because when trying to buy it from the likes of Amazon or other NON-Irish companies you will find they either charge you one heck of a lot of money to ship, or they can’t ship it to Ireland because it’s an aerosol. We don’t have the problem here at www.hairlossireland.ie. It only comes in five colours Black, Dark Brown, Medium Brown, Light Brown and Grey. Soe people use a combination of colours and sometimes even a combination of Fibres and the Coloured Hair Thickener Spray. As we are now officially in the middle of summer and while the brighter days are here it is important that you remember to use your hair products more so as the brighter weather can show up the bits you’d rather were not seen. Make sure that you make Toppik part of your hair today hair tomorrow routine. I spoke to a client the night before this posting and he said he only puts his Toppik hair fibres on when going out on a Saturday night. I asked why this was and his answer “because he gives me the confidence to approach ladies and enjoy their company” then I said to him ” this did bring a smile to my face and I replied”Think of the confidence you’d have every day if you used Toppik as part of your hair routine”. I can clearly say he left with a new view of how often to use his Toppik product.